It's hard to believe, but another half a year of reading has gone by! This is the list of books I've completed in the last 6 months. Note the influence of homeschooling this year--and books read during our long winter of illness! Don't forget: Read the Bible more than any other book, and not all of these books are recommended! Some are quite the opposite! This is part of a long standing tradition (I have my lists saved from 1999 on). Here are the lists for 2007 (first half, second half), 2006 (first half, second half), and 2005 (first half, second half). That we humbly call upon God to use SOF for His glory. The conference in St. Louis was pretty amazing. I'll be writing more about it soon for both this blog and EFCA Today. The most exciting thing was the adoption of a new statement of faith for our assocation of churches. Byron Harvey did a nice job of summarizing the debate on the floor. The most amazing thing to me was how holy the discussion was. With just a few brief (but painful) exceptions, the discussion was respectful and kind, focused on issues and doctrine, not people or personalities, and full of Christ! My favorite moment of the whole conference wasn't the 86% positive affirmation of the new statement of faith or even the "unity resolution" offered by Byron after the big vote (to which I got to be the "second"), but when one of the men at the microphone publically apologized for how he had spoken, written, and acted during the heat of the process last year. That was powerful! Praise Him--for a new Statement of Faith, and for the holy people that he both used to craft it and deliberate on it, and adopt it. I'm blessed to be a part of this family of churches. Multi-Chromatic. Biblical Counseling addresses the whole person, body and soul. It recognizes both suffering (what comes at us) and sin (what comes out of us) as causes and effects in life-problems. Biblical counselors understand that life is not “thin” and always reducible to simple principles. Life is richly multi-layered and surprisingly complex. Not all worriers worry the same even though their anxiety is part of the same family of problems. Some depression stems from fear, some from anger, some from who-knows-where. Someone who cuts themselves may be saying something very different with their behavior than someone else. Fearless. Biblical Counseling does not shy away from the “hard” problems. The gospel addresses things we’d rather run from, such as addictions, depression, anxiety, and self-injury. It is also not afraid of engaging with powerful secular theories (ex. addiction as disease) or half-truth Christian psychological theories (ex. “rest in God’s love so that you don’t have to rely on the affection and admiration of other people”). Because of common grace, Biblical Counselors can recognize and rejoice in the good of these other approaches while graciously and vigorously setting out the biblical alternative. Realistic. Biblical Counselors recognize that change is progressive. Most often, life change is a process that can take time and involve setbacks. Change is possible (optimism), but change is difficult (realism). It helps that our goal is increasing conformity to the image of Christ, not well-oiled, functioning lives. Biblical Counselors (at their best) don’t aim at simply “making life work”–which, in some situations, could be an almost impossible goal. Heart-Focused. Even though Biblical Counseling addresses the whole person, it is particularly focused on “the heart,” the spiritual control-center of our lives. Biblical Counselors know that we live “out of our hearts” and are driven, not by psychological “needs,” but by our worship, beliefs, inner motives, wants. Our hearts are “radically vertical.” All of life is worship–whether true or false. Biblical Counselors apply biblical categories to heart-motives. For example, “Kingdom allegiances” can drive our fear, worry, and anxiety, and “idolatry” is an helpful biblical category for understanding addiction. Biblical Counselors know that sin is not “thin” and can’t be reduced to our transgressive behaviors. Indwelling sin taints our whole person–desires, thoughts, attitudes, and all. The true and lasting solutions to our life problems have to address the heart with the gospel of Jesus Christ. Horizontal. Though our hearts are radically vertical, our lives are lived horizontally in community with other people. And we are all fellow sufferers and fellow sinners. Biblical Counselors know that there is no “us” and “them,” no “priestly counselor class.” Each believer is a priest, and each believer needs ministry. This actually helps the Biblical Counselor because he/she knows that they have a common experience of life with those they are helping. This horizontal dimension is simply a practical ecclesiology. Truth-In-Love-Speaking. Biblical Counseling involves talking (note the speeches between the author and the addict named “Jim” in A Banquet in the Grave). The talking, however, is not just a Rogerian feeling-fest, but the speaking of biblical truth in love to the person caught in the problem. The content of the talking is the gospel displayed in its rich and manifold ways. Just as the Biblical Counselor knows that life is not “thin” and neither is sin, the counselor also knows that the Bible is not “thin.” The Bible, even with its one unified gospel message, is like a symphony carrying its melody into the variegated richness of everyday life. Biblical Counseling is biblical. It believes that the Scriptures sufficiently speak to everything–not saying everything there is to say about everything–but saying the most important things about everything that there is. The Bible does this in helpfully multi-chromatic ways. Biblical Counseling (at its best) does not say, “Take two Bible verses and call me in the morning.” Instead, it employs the rich and colorful depth of Scripture’s Big Story about Jesus and its multiple useful genres overlain on the vicissitudes of life. What to know what's going on in St. Louis? My buddy Byron Harvey is live-blogging the conference and already has up 3 installments. Our family is off to St. Louis for the EFCA National Leadership Conference. This year's conference is especially important as we are considering amending the Statement of Faith of our association of churches, a process which I've been heavily engaged in and think is a good move for our family of churches. Pray for us as we travel (Heather gets to go again for the first time in 9 years) and as we experience the conference. Matt's Messages - "10 Things I'm Hoping for in the Next 10 Years"
We’ve spent two weeks looking backwards on 10 years of ministry together. Today, I’d like for us to spend some time looking forward to the future. Now, I don’t have a crystal ball. I may not be here 10 years from now. I may not be here 10 minutes from now. James says, “You don’t even know what will happen tomorrow. What is your life? You are a mist that appears for a little while and then vanishes. Instead, you ought to say, ‘If it is the Lord’s will, we will live and do this or that’” (James 4:14-15). But these are 10 Things that I am hoping for. That I’m dreaming of. That if the Lord gives us 10 more years here as your pastor, I’m praying that God will do these 10 things in and through us together. Let’s read 2 Timothy 4:1-8 and then I’ll give you this week’s 10 Things. Paul is giving his final instructions to Pastor Timothy. Last week, I held up the worship bulletin from June 14, 1998–my first official Sunday as your Pastor. And I thought this week, what if I could hold up the bulletin today from June 17th, 2018? 2018. That sounds like a long way away, but it’s just 10 years! What might the bulletin say for Sunday June 17th, 2018? That will be not only my 20th anniversary as your Pastor (Lord-willing), it will also be Heather and my 24th wedding anniversary, that weekend. What else might the bulletin say? That would be a long one! You think I preach long now! What else might it say? Well, as I thought about that, I started dreaming about the next 10 years, and what I would love to see happen. And I began to list things I’m hoping for. Here’s #1. #1. DOING MORE OF THE SAME. I’m not planning a major overhaul of our ministry direction and focus in the next 10 years. I think that we, as a church, have the set the right general course, and we just need to keep steering towards it. I think that we continue to try to glorify God by bringing people into a love relationship with Jesus Christ through worship, instruction, fellowship, evangelism, and service. I think that we continue to strive to be a gospel-centered church. Doing more of the same. I hope to stay a “broken record” preaching the good news, the evangel, the gospel of Jesus Christ and with it the whole counsel of God, the Bible. That’s what I’m hoping for: More of the Same. That doesn’t mean that I don’t want anything to change. But the central most important things–I’m hoping won’t change at all. #2. GROWING OLDER, GETTING WISER. I’m looking forward to watching my family grow up. In 2018, Robin will be turning 18 in July. Andrew will be turning 17 in December. Peter will be turning 15. And Isaac 14. I can’t wait to see what God is going to do with each of their lives. And I’m looking forward to seeing Heather blossom even more as a godly mother, and as the kids get older seeing her more free to do more effective ministry with other wives and mothers and their children. I look forward to seeing the other kids in our church grow up. I think Donovan was just 4 years old when I came. He was like Isaac’s age. He’ll be a young man of 24 in 2018. I had the privilege of dedicating a number of the little children here today. I can’t wait to see what you grow up to be. I expect to lose even more hair and see a lot of what’s left turn grey. And I hope that as I get older I get wiser. I hope that’s me. A wise and righteous man growing wiser still. I hope that I grow in my ability to skillfully apply the Scriptures to my life and other people’s lives. To be a sought after counselor because I know God’s wisdom. To be a life coach for others. To mentor. To pray more intelligently and scripturally for others. To have more wisdom for leading our church. Frankly, I often don’t know what to do. And that’s great, in one sense. Because it keeps me dependent on the Lord for guidance and direction. But I want more for you than muddled thinking and vague wisdom. I’m praying that your pastor grows in wisdom as he grows older. I feel like I’ve grown several feet in wisdom in the last decade, but I see how far that I have to go. Would you pray with me for that? #3. REACHING HUNDREDS, MAYBE THOUSANDS. I’m hoping for great evangelistic fruitfulness in our ministry together over the next 10 years. Not that I, personally, would lead thousands to Jesus Christ, though that would be great. Do it, Lord! But that we together would reach thousands. As we each individually share the gospel with others and see their lives transformed and then as they turn around and share the gospel with others and see their lives transformed. It’s multiplying! It’s exponential evangelism! We have the greatest message in the world. I’m hoping that we don’t grow ashamed of it, but share it with those who need to hear it. And that God would use our efforts to reach countless people for Jesus Christ. Not all of those people will go to our church. I doubt that our church will ever be a thousand people large–though stranger things have happened! But our church can be used to do big things for the Lord. We heard today about the Outreach Ideas Team’s idea of a Free Oil Change Outreach. That’s one of 4 outreaches being planned right now. I think that’s awesome! And that means, at least, sharing the gospel yourself and equipping others to do it, too. I pray that we would reach hundreds, maybe thousands for Christ. I know that we’re already part of a multiplying movement. It’s so exciting to be a part of the church planting adventure in the Allegheny District. We pray and give just a little bit each month, but we’re part of planting churches that will reach the lost–people that you and I could never reach on our own. That’s exciting. Wouldn’t it be great if there were a couple hundred healthy new churches in our district in the next 10 years? God could do that. It starts with our just sharing the gospel. Can I do that again right here? Jesus Christ died on the Cross to bring unrighteous people to God. And He is calling on sinners like you and me to repent and trust in Him alone for the forgiveness of sins and the sure hope of eternal life. If you are not yet a faith-follower of Jesus Christ, I invite you, I challenge you, to become one today. Receive Jesus Christ as your King and Rescuer. Allow Him to enter and change your life forever. Be the first of the hundreds or thousands that will come to Christ in the next 10 years. I call upon you to believe in Jesus Christ and Him alone. #4. MAKING DISCIPLES, NOT JUST DECISIONS. The Lord’s great commission calls upon us to make disciples of people from all nations. Not just to help them to pray a prayer and then go on their merry way. It’s not enough for our church to just try to get people to give mental assent to Jesus Christ. They need to entrust themselves and their whole lives to following Him. I’m hoping that we have scores and scads of men, women, and children who not only claim to love Jesus but live it out as faith-FOLLOWERS of Jesus. Christianity in the West Branch Area is a mile-wide and an inch deep. Everybody seems to think they are a Christian. But we need Real Christians to really live it out day by day. I’m hoping that in the next 10 years our church is full of Real Christ-Followers. Who ask the Lord, “What do you want me to do?” And then do it! Who not only say they believe the Bible, but who take it as their marching orders! Who go against the flow of the culture and live distinct lives. The culture is probably not going to get a lot better in the next 10 years. Homosexual “marriage” is now legal. Homeschooling is not! And Hollywood rules! What will keep the culture from continuing to going down hill? Maybe the Lord will be gracious and grant us a national awakening. But even if He does not, I pray that we as a church would follow Jesus–no matter what. Recently, in Canada, a pastor wrote a letter to the editor opposing homosexuality and its political agenda. The pastor was fined $5,000, ordered to apologize, and to not write or speak about homosexuality in public again. That kind of thing might happen down here in the next 10 years. I may have to go to prison for speaking the truth. I hope not. But it’s more important to speak the truth than to be popular. I pray that we will stay faithful and follow Christ as His disciples. And make disciples that make disciples for Jesus Christ. #5. RAISING UP THE NEXT GENERATION OF LEADERS. That’s what Paul was doing with Timothy. That’s leadership development. And we need it here at Lanse Free Church. We’ve got a great bunch of leaders here. I know pastors who would envy the line-up of leaders that we have right here at LEFC. But very few of them are young. For example. Could I have the Leadership Board stand? These are 7 great guys who serve with me on the Leadership Board. Thank you, men, for serving our church and leading us. Notice something about their ages? A few of our elders have been on our board for 25 or more years. Some of the men are younger than others. But I’m still the youngest board member. I’ve been a board member here for 10 years, but I’m still the youngest man on our board. We need to be raising up the next generation of men to lead our church family. Who will be the Wally Kephart and the Blair Murray types to lead Lanse Free Church in 2018? You might be sitting here. I want to talk to you about stepping up to leadership. I want to develop you as disciples and as leaders. I want to spend a great deal of my time in the next 10 years developing the next generation of leaders. And number six goes with that. #6. LAUNCHING MISSIONARIES INTO THE WORLD HARVEST. I’m hoping that we raise up some international missionaries from the young people here in this room. We sent off the Forceys. Then we sent off the Weatherlys. Then we sent off the Gibboneys from our own number. Whose going to follow them? I hope that we not only raise up leaders for our own church, but that we raise up leaders for God’s church elsewhere. I’m praying for my kids that they would discern if God had an international calling on their lives. And I’m praying it for your kids, too. One of the greatest things about having missionaries come through and visit is getting a sense of what God is going globally and how we can be a part of it. Our church has been a great missionary supporting church. I’m praying that we would grow even more as a great missionary sending church. I talked last week about this, so I won’t say much now. But I see the family in danger in our culture and in our community–because of not building off of God’s steadfast blueprints. I hope that in the next 10 years, our church stands firm, built on the Rock of Christ, with families that are distinctly different from the culture. Even from the direction that many in the church are going. I’m hoping for strong families. This is one that I think we need to grow in a lot more. I’ve not done a good job of leading us into this one, and I want to do better. What I mean here is that I hope that if we closed our doors, our community would cry. That we, as a church, would truly be “salt and light” in our community, real difference-making in our presence (Matthew 5:13-16). So that our presence is felt. I’m praying that we find more and more ways to serve our community and care for theirs needs, both spiritual and more tangible. That our campus is seen as a community asset–an hope-filled place that is known for loving the community and possessing biblical wisdom for life. We’ve experienced a taste of that from time to time. But I’m hoping that in 2018 it just seems natural. What I mean by that is growing both numerically and in our usefulness. Here I’m thinking of things like developing our master plan, upgrading our facilities, re-doing some of our leadership structures, hiring more staff, engaging with new technologies like the Internet, and so forth. I would love to see our influence grow. Being a resource to other churches. Doing conferences that serve others. Training pastors. Some day I’d like to write book that helps others. None of that is very important, on its own. It isn’t the gospel. But the gospel is important enough on its own for us to improve how we go about building a church on it. Of course, that will mean undergoing change. And change is not always fun, is it? But this church has done a wonderful job in 116 years of navigating change. Does anybody know how many buildings this church has had? This is our fourth facility. Have you ever thought that there might be a fifth? How many languages have we worshiped in? English is our SECOND language. Pastor Johansen preached in this church for 11 years in Sweedish. He’s the only one of this church’s pastor that has me beat for longevity. We haven’t yet hit half of our history in English! In 2012, we will have reached the point where our ministry has been half in English and half in Swedish. Do you think we might need to change in the future and pick up a third language? Maybe so. Maybe we’ll need to change the name of our church. I think that we might have been called “Lanse Covenant Church” for a while back in the 60's. Maybe we need to think up a third name for our church in the next decade. We’ll need to change some things to meet the demands of the next 10 years. And to expand our capacities to multiply our usefulness in our community. But this will never change. Number 10. I’m hoping that our ministry partnership will stay true to the Lord’s direction and desires for Lanse Free Church. That what we want is for our Lord to be pleased. These 10 Things I’m Hoping FOR. But this one thing I’m hoping IN: The Lord. I need to make some adjustments in my life, and here's one. From now on, I will blog on Friday afternoons, and that's it. Blogging is good. But a soul at rest in Christ is better. Maybe I'm not the only one who feels a need to draw some new boundaries. News Flash (For a Day Still Future) - Thanks, Jeff! Pastor Matthew “Matt” Mitchell, was nearly killed last Monday in a freak hunting incident on the opening day of buck season. Mitchell was hunting in the vicinity of Hannah Furnace Road with friend and hunting mentor John Kristofits when Kristofits received a call on his cell phone and had to leave for a family emergency. According to witnesses, Mitchell was seen “on stand” at around 10 a.m. About that time, other hunters in the area reported seeing a buck of unusual size running through the woods like greased lightning. The “monster buck” reportedly had a rack bigger than anyone had ever seen in the area. Some hunters estimate the animal had as many as 24 points. Several shots were fired from all directions as the big buck ran past hunter after hunter. Authorities say the animal then ran towards Mitchell’s location. The rest is the stuff legends are made of. According to his own testimony, Mitchell heard the chorus of shots and the sound of a large animal crashing through the brush in his direction. He raised his rifle in anticipation, and could not believe what he saw as the buck came into view and stopped only 10 yards away. “Everything went silent in that moment,” he explained, “it was like I was in a dream. I could hear the buck panting, and feel my heart beating. But then I froze. It was so huge, so enormous, so beautiful, I just stood there staring. I couldn’t pull the trigger.” That was when Mitchell became aware of the voices around him yelling “SHOOT! SHOOT!” As if waking from a dream, Mitchell’s mind began to clear, and he noticed the massive set of antlers heading straight towards him. The buck was charging. Mitchell fired as the buck lunged, huffing out blasts of steam like a runaway freight train. He fired again, but the buck kept coming. A third time he fired, and the behemoth’s antlers drilled into the bark of the tree behind him, pinning him against the trunk. Mitchell lost consciousness. It took 3 other hunters and 2 Wildlife Conservation Officers 2 hours to free the first-time hunter. Game Commission authorities later determined that all 3 of Mitchell’s bullets had in fact penetrated the animal’s heart. I gave my lousy opinion and all I got was this T-Shirt. My blogging addiction finally paid off. I was one of the first 9 to fill out the 9marks survey. I really like the 9marks ministry. I'm using or recommending their stuff all of the time. Always provocative and full of food for thought. Check them out. Dan Ledford applying Philippians 1:1-11 to him and his church family this Summer. There is also a campaign to multiply its effects by buying 10 copies. Good idea! Matt's Messages "10 Things I've Been Teaching in the First 10 Years"
10 years ago yesterday, was my first official Sunday as Pastor of Lanse Evangelical Free Church. June 14, 1998. My first Sunday “in the pulpit.” How many think (or even remember) that they were here that Sunday? Raise your hand. Do you remember what my text was? Isaiah 40. Last week, I spoke about 10 Things I’ve Learned in the First 10 Years. Today, I want to talk about 10 Things that I’ve taught. A lot has changed here in the last decade. There was no Ark Park out there. There were no banners on the walls in here. There were no soft-cushy chairs in the fellowship hall. I was not a father on my first Father’s Day here as your pastor–which was the next Sunday, June 21, 1998. Back then, when I wasn’t writing out my sermons longhand on a yellow legal-pad, I was typing them on a green-screen laptop in the basement! Yes, green-screen! And I stored them on little plastic diskettes. Remember those? But, I hope that nothing significant has changed in what I’ve been teaching here. I hope that I have been teaching God’s eternal truth applied to our contemporary lives. I want to sound like a broken record--playing the same songs over and over again. That’s what I’ve set out to try to faithfully do: to teach God’s eternal truth applied to our contemporary lives. This week, I reviewed the content of my first 400 sermons or so. I didn’t read each one, in fact, I barely just looked at the titles. That was a lot of ground to cover in 10 years! And it doesn’t include stand-alone messages or shorter two week kind of series. What I want to do this morning is to summarize these 10 years in 10 points. I want to point out 10 major themes that we’ve emphasized in the last 10 years in many sermons and other kinds of teaching times. Key points of practical biblical theology. And it starts with #1. THE GLORY OF GOD. Isaiah 40 was my text on that first Sunday. This is what I wanted to communicate–the starting point and the center of my preaching ministry–the awesome gloriousness of God. I wish I could take a couple of weeks and preach this whole chapter again. I can’t do it justice in 1 little point of 10. But you get the flavor just from reading it, don’t you, of the sheer glory of God?!! God has. All of the oceans of the Earth fit comfortably in the palm of His hand. With the breadth of his hand, He’s marked off the heavens. That’s how GREAT He is! You see the Milky Way at night? And everything in the universe exists for His glory. He is the reason for everything! He is the center of everything! He is the sun, everything else is just a planet. My prayer has been that each and every week we would get a glimpse of the glory of God. A triune God who is all powerful, almighty, all everywhere, omnipresent, all wise, omniscient, all perfect–holy, independent, immutable, unchanging, infinite, eternal, timeless, good, loving, merciful, faithful, righteous, just, jealous, wrathful, joyful, blessed, beautiful, majestic, kingly, glorious in every way! God is glorious and worthy to be worshipped. We are called to magnify Him. Not like a microscope. But like a telescope. Remember back when I had a both a microscope and telescope up here on stage with me? If you don’t, don’t feel bad it was the Fall of 1999. I said then that there are 2 kinds of magnifying. We are called to magnify God, but not like a microscope that takes something small and magnifies it to seem bigger. The God of Isaiah 40 is not small! But we are called to magnify Him (that’s another word for worship) like a telescope–taking something that is unimaginably huge and yet separated from us because of a great distance (in our case, because of the curse, because of the Fall) and making it visible to the eye. That’s what we are supposed to do as Christians and as church, magnify the glory of God! #2. THE POWER OF THE GOSPEL. Why would a glorious God like this have anything to do with rebel sinners like you and me? We were created to reflect the glory of God, but, in Adam, and in each one of us, we have chosen to sin and fall short of the glory of God. But God had a plan. It was conceived in eternity past and worked out in history, and it is centered on the person of Jesus Christ, God become Man. The fullness of God came to reside in a human. I’ve preached about this wonderful Incarnation for 10 Christmases here. And then this Jesus lived a perfect life. We’ve watched His life as we’ve studied every verse of both the Gospel of John and the Gospel of Mark, so far. And what comes at the end of each of the gospels? It takes up at least one third and almost of a half of each one–Jesus’ last week. And as He hung there, He paid the penalty for all of the sins of the world. We have remembered His death in every baptism and every bite of bread and sip of the cup at the Lord’s Table. I hope that I’ve talked about the Cross every single Sunday for the last 10 years. But Jesus didn’t stay dead! On the third day, He rose from the grave–victorious! We have celebrated it together for 10 Resurrection Sundays–and every Sunday! He was resurrected for our justification. We are declared righteous because He lives! Not because of anything we have done, but because of what Christ and Christ alone has done–we can be saved. This is the gospel. This is the good news of Jesus Christ–and it’s at the center of our message. We are cross-centered. We are gospel-centered. This is the Main Thing. And remember, the Main Thing is the Keep the Main Thing the Main Thing! And it calls for a response. It calls for a response from everyone here. If you have not yet responded to the gracious gospel of Jesus Christ, I call upon you to do so today. Repent. Turn from your sins and put your faith and trust in Jesus Christ and what He did for you on that bloody Cross. It calls for a response from everyone everywhere. That’s why we have emphasized a love for the lost and reaching out to our community. And that’s why we have such an emphases on global missions here. We believe in the power of the gospel for everyone who believes–that the nations need to know about Jesus’ death and resurrection. And we need to daily live in the power of the gospel. The gospel is not just how we get saved. It’s how we live day by day in God’s sight. That’s why we’ve learned to answer the question, “How are you?” with...what? “Better than I deserve.” Because of the gospel. If you came to grasp the gospel here in the last 10 years, would you stand? Thank you. And there have been others. Praise God! “Woe to me if I do not preach the gospel!” (1 Corinthians 9:16). #3. THE LOVE OF JESUS CHRIST. That glorious gospel of grace, when believed, brings us into a love relationship with Jesus Christ. Let me explain what I mean by that phrase. It’s also part of our purpose statement here. What we mean by it is that we now know that we are loved by God through Jesus Christ and we now love Him back. We are loved by Jesus! Our relationship has changed from enemy to sitting at His table. We have gone from dead to alive. We have gone from slaves to sin to God’s own children, joint heirs with Jesus! We follow Jesus Christ as His disciples–men and women who are fully devoted, fully in love, fully passionate about following Him! And we love Him in return. We are growing in our obedience to the great commandment: love the Lord your God. Do you know how much Jesus loves you? I hope you are knowing that. I’ve been trying to teach it. I know that I have failed at times. Sometimes, I have probably made it sound like you need to clean up your act or Jesus won’t love you. But it’s actually like this. Jesus loves you. And He loves you right where you are. But He loves you too much to let you stay there. He will love you into cleaning up your act. Receive His love. This is especially true when we go through trials. When the hard times come. One of the emphases of my preaching ministry has been teach on God’s sovereignty over all things–including the bad things that happen to me. Remember the story of Joseph at the end of Genesis? Even in the midst of our trials, and I know that some of you are going through trials right now–even in the midst of our trials, we can know the sweet love of Jesus. And we know this on the authority of God’s Word. #4. THE AUTHORITY OF THE BIBLE. All 10 years, all 400 plus sermons have been based on the authority of the Scriptures. If this isn’t God’s Word, then I’m wasting my time. I’ve been trying to teach the Big Picture Storyline of the Bible. In 2003, I began a long term project of preaching through the Old Testament. In odd numbered years, I’m taking a major Old Testament book that carries on the storyline and moving us through it. In 2003, it was Genesis. And we learned among other things...God always keeps His promises. In 2005, we did Exodus. God rescues His people and lives among them. In 2007, we preached through Numbers. God is both holy and gracious in the wilderness. In 2009, we’ll take up the next big book. I’m doing that because there is a Grand Story in this Book, centered on Jesus Christ and making sense of everything we are going through in our personal stories. We’re studying it this way to learn that we aren’t the main actors in our life’s plays! He is the main character. I’ve tried to emphasize application in my preaching. “All Scripture is God-breathed and is USEFUL for teaching, rebuking, correcting, and training in righteousness” so that we are fully equipped for everything coming our way. This week is Family BIBLE Week for a reason. It is our ultimate authority. #5. THE FIGHT AGAINST SIN. I talked last week about I’ve learned what a big sinner I really am. God is calling us to repent of our sin and grow in holiness. Remember when we went through the book of Hosea and I talked about my carpenter ants? Big little black guys with tool belts on? Well, they’re back this Summer! They didn’t show up in 2007. But they’re back in 2006. And if I don’t get around to doing something, we could lose our house! I think, in the last 10 years, we’ve learned a lot about the exceedingly sinfulness of sin. We are saved by grace and have a new nature, but the old fleshly nature still hangs around like an insurgent force. And it must be rooted out and taken down. I pray that the preaching of God’s Word of grace in season and out of season here from this pulpit would produce holy people–zealous for good works. #6. THE PRECIOUSNESS OF PRAYER. That love relationship includes access to God through Jesus Christ by the Holy Spirit. We are invited to talk to Him. To take our burdens to Him. To ask Him to work in the world and in our lives. He is the King, but we are invited to boldly approach His throne. We are to live our lives on speaker-phone, staying in touch with God all day long. #7. THE BLUEPRINT FOR THE FAMILY. As we’ve studied Ephesians, Colossians, 1 Peter, and 1 Timothy, we’ve learned a lot of biblical principles that relate to the Christian family. But in the Fall of 2006, I preached an entire Fall series on God’s blueprints for the family. Husbands and Dads, God has appointed you as servant leaders in your home. We are reminded of that today as we celebrate Father’s Day. You are to take the lead. Wives are called to submit and to support. God has a blueprint here in Scripture for us to follow so that our families are built strong–like the house on rock. Families in our culture are built, for the most part, on the sand. Which family will get hit with a storm? Jesus’ story says that both will. Which one will stand firm? Only the one built on the Solid Rock. #8. THE IMPORTANCE OF THE LOCAL CHURCH. I’ve preach several messages and at least 2 series on the Local Church. I’ve emphasized that the local church is important to the heart of God and it should be important to us, as well. We’ve called that doing our purpose through our “WIFES.” WIFES. The church is the main place where we work out our salvation in community with other people. The local church is supposed to be Cross-Centered, and purposeful, and joy-fully led by qualified leaders and practice church discipline so that we all enjoy the safety of accountability. I’ve taught again and again that everyone should be baptized and become members of a local church. Sometimes, I think that some of you think that I get a signing bonus for each new member! I don’t! I do think that our church gets a bonus when each of you becomes a member. But I don’t care if you join our church or another of like precious faith. God is working in the church and wants us to all be a part of it, too. #9. THE FELLOWSHIP OF THE HOLY SPIRIT. We’ve emphasized that a lot in the last several months, but it should be said again. God is present and living inside of all Real Christians. And, inside of us, He’s re-working us into the image of Christ, applying the New Covenant to our hearts, producing His fruit in us, and empowering us for bold witness and service in the Body of Christ. Don’t let the Summer go on and forget about the Spirit. He’s at work in us. Don’t grieve Him. Don’t quench Him. Don’t resist Him. What’s He saying to you today in the pages of His inspired Word? What have you been reminded of today that you need to apply to yourself anew? Perhaps you have grown tired and weary. The Christian life seems heavy and un-doable to you. Maybe you’re complaining that your way seems hidden from the Lord and He’s forgotten you. #10. I’ve been teaching and will continue to teach about THE ANTICIPATION OF CHRIST’S RETURN. Jesus is coming back. And He’s coming back soon. We need to live lives of constant expectancy. Reaching out to those who have not yet seen the glory of God or responded to the gospel or fallen in love with Jesus. And living in constant expectancy of His return. Following His authoritative, fighting against sin, drawing near in prayer, building our families on the Gospel, linking arm and arm with the family of God, the local church, in fellowship with the Holy Spirit. I pray that the preaching of God’s word at Lanse Evangelical Free Church would be a part of those efforts now and until we see Him face to face. This is part of our EFCA emphasis on God-Sightings. T.J. Addington on excruciating (and blessed) way he learned about the indispensability of teams. More pictures of the welcome of our newest regional church planter. Byron Harvey on Acts 20:7-16. I always like to remember this convicting test of things: suppose you had an audience with the president. Would you mosey into a meeting with the president, unprepared and unconcerned? Or would you prepare yourself? Too many folks act like Sunday morning catches them by surprise! Why not talk to God before you get to church? Psalm 100:4 – “I will enter His gates with thanksgiving in my heart; I will enter His courts with praise!” How’d you enter? - Remember that worship isn’t just about you and God—it’s about others too! • Are there guests who need welcoming? • Is there some way you can help out? There is only one way to live: all-out, go-for-broke, risk-taking, shed-some-silly-inhibitions, laugh-heartily, pedal-to-the-metal, ferociously joyful and grateful enthusiasm for the Lord Jesus Christ. Halfway Christianity is the most miserable existence of all. Halfway Christians know enough to feel guilty about themselves but haven’t gone far enough to get happy in Christ. Wholehearted Christianity is very happy. Amen. I call that "Hot Orthodoxy." Owen Strachan on the little-thought-of sin of flattery. Dan Ledford on Discovering and Obeying God's Will (Part 1). Matt's Messages "10 Things I've Learned in the First 10 Years"
Heather and I have been here now for 10 years. This week, I’m completing my 10th year as your Pastor. My official start date was June 14, 1998. A whole decade! A lot has changed in those 10 years. Gasoline was $.89 a gallon at the pump at Kwik Fill when we started in 1998! Here is a pile of all of my monthly planning calendars for the last 10 years. 10 years of appointments, sermons, meetings, events, everything. A LOT has happened in those 10 years! Since 10 years seemed to me like a big deal, I decided to speak for 3 weeks on “10 Things,” this Sunday, next Sunday, and the next Sunday. 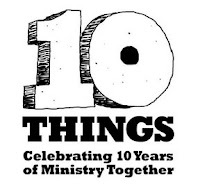 “10 Things: Celebrating 10 Years of Ministry Together.” You and us. Heather was sorry that she couldn’t be here this morning. She is at my Aunt house for a family baby shower for my cousin today. But she wishes that she could be here and will be back next week. Now, these are not all of the things that I’ve learned in the first 10 years, and maybe aren’t the 10 most important things that I’ve learned in the first 10 years. But they are the ones that sprang to mind as I prepared to speak to you this morning. It’s not necessarily that I didn’t know these things before I became you pastor, but being your pastor has given me a deeper awareness and knowledge of them. I’ve experienced them–and that’s the best kind of learning. Because there are 10, we’ll have to move quickly through each one, though I could talk on and on about each of them. 10 Things I’ve Learned in the First 10 Years. #1. HOW GOD GIVES US OUR DESIRES AND CHANGES THEM, TOO. I’m going to start the story in August of 1997. I was beginning my third year as a seminarian at Trinity Evangelical Divinity School in Deerfield, Illinois. I was also a youth pastor at a great little Bible church in Zion, Illinois. I had had no desire to leave that ministry. I think the people there thought of me as a seminary student who also worked in their church. I thought of myself as a youth pastor that also happened to go to seminary. But through a chain of events that I won’t go into here, Heather and I became what we called “untethered” to the ministry there at Beach Bible Church. We still loved the people, but we began to think that God had a different ministry for us somewhere else–especially a ministry of preaching and solo-pastoring a church. I was increasingly realizing that I wasn’t cut out for specialization and being a youth-pastor. I was a generalist pastor at heart. A G.P. So, Heather and I went on a camping trip, across country to my favorite place on God’s Green Earth, Cook Forest State Park near Clarion Pennsylvania. While we were there, Heather and I stopped in a little coffee shop on the main drag in Clarion and dreamed about what God would have for us next. Fast forward 6 months. We had continued to pray and to seek God’s will for us, and Trinity provided the next step. In January of 1998, they had all of the EFCA district superintendents come onto campus and meet with prospective pastors about job openings in their districts. That weekend, we met a phenomenal man named LeRoy Glover. And he was district superintendent of a little district that encompassed the eastern half of Ohio (where I’m from) and the western half of Pennsylvania where Cook Forest is. And he had 7 churches with openings! And LeRoy said that he would give our information to the search committees, including one in a place I’d never heard of Lanse, Pennsylvania. The search committee’s chairman there was a man named Wallace Kephart. And that started an amazing relationship! You know, a year later, Heather and I left our home in August and drove to Cook Forest and sat in that same coffee shop–it only took a hour and a half to get there! God had plopped us down in the middle of Penn’s Woods! He gives us the desires of our hearts. Notice what the verse actually says though. If my delight is in the Lord, what will I really want? I’ll want Him and what He wants! Another gift God gave us was in the character of this church. I had a prayer-list of 7 items that I was looking for in a church to serve. 1. A place with potential. 2. A place that can support a full-time pastor and family financially (though not extravagantly). 3. A place that is evangelical (not fundamentalist nor liberal). 4. A place that is somewhat interested in creativity and innovation. 6. A place with a small-town, small suburban, or rural feel. 7. A place that is excited about Heather and I. God gave us all 7 of those in you! All 7! There have been times along the way when I’ve thought about leaving Lanse Free Church. Sometimes things aren’t as exciting as others. And my desires have changed at times. But I have come back again and again to the sense of call I had when we came to candidate in April of 1998. I remember in the middle of meeting everyone and interviewing and so on going for a long walk in the rain in some State gamelands. And being assured personally by Lord, my Delight, that this is where He had for us to be. 2. HOW SWEET IT IS TO BE LOVED BY A CHURCH FAMILY. That’s how I feel about being situated here. The boundary lines have fallen for me in pleasant places! I never would have known how sweet it is to be loved by a church family like you if I hadn’t experienced it these last 10 years. You have been so loving and caring for me and my family. When we first arrived, there was a group of you who helped us moved in. I remember Bea and Vera there with a basket of food and cleaning supplies provided by the church. You helped us get our first rental house up in Bigler and find things and made us feel right at home. You have rejoiced with the births of each of our children and taken care of us when we are sick. You’ve done babysitting and watched out for us and appreciated us in October every year. You’ve paid me a generous salary that has allowed us to do something financially that I didn’t expect to be able to do, including build our own home! You’ve given us big and little gifts like a shed and work-days on our property and our big dining room table! And you’ve given me time off for vacations, conferences, classes, and last year even a mini-sabbatical that helped me to recharge at a significant point. I could go on and on and on and on and on about how your have loved me and Heather and our family. If I’m the shepherd, you’ve been very loyal and loving sheep! You’ve treated me like an Ox! And I mean that as a good thing! You’ve provided me with double honor, and I’m grateful. Let me tell one story to illustrate this. We moved into our new house (which is another story of God’s giving us our desires and also changing them along the way) in February of 2002. On Saturday morning February 9th, we woke up and got dressed and then out of nowhere a SWAT Team of Lanse Free Church people swooped down at our house in Bigler and carried off all of our stuff to Lanse! There was like 15 pick-up trucks came in and out and took the stuff up to our new house–where a team of ladies started putting the things away! We moved everything in 3 hours and it was livable by the time I left Bigler and got to Lanse! One of the last things to go was the piano. Anyone remember this? We got it into the back of the pickup truck, but we couldn’t get the tailgate up. So, someone had to sit in the bed of the truck to watch over the piano as it went up and down those hills on the Cut-Off. Guess who did it? Blair Murray. And Heather was all worried about and she still remembers being at our new place in Lanse and hearing the truck pull in with Blair playing away at the keys! Thank you for loving us. How Sweet It Is to Be Loved by You! We saw this very clearly in another way with #3. #3. HOW FAITHFUL GOD IS WHEN WE GO THROUGH TRIALS. We hadn’t been here a whole year when we lost our first child. Heather was 6 months along when we went to district conference and we realized taht the baby wasn’t moving any more. I still remember everything from that night, the drive the in rain to the emergency room, the wailing and sobbing, the drive home in the light April snow, going to Centre Community Hospital, giving birth, holding her in our arms. That is the worst thing that every happened to us...so far. And you folks loved us through it. You brought meals, you listened, you gave us space, you cared for us, you walked through it with us. But even more importantly, God loved us through it. We learned the deepest truth of Romans 8:32 (remember that I preached on Romans 8:32 just a week after Charis was born?). We can count on it. God gave up Jesus. How could He fail to give us everything else for our good? Even the worst things. He won’t fail. He will give us all things. We have learned that in the hard times. We have, as a whole church, haven’t we? You all have gone through hard times. If you haven’t, just wait, it’s coming. But God is faithful in those hard times! #4. HOW MUCH LOVE A PASTOR CAN REALLY HAVE FOR A CHURCH. I didn’t know how much I could fall in love with a group of people. I am learning what that means. We have thoroughly loved being a part of your lives. Visiting in your homes. As you probably know, I love to visit. If you’d like me to visit you, just let me know. I’ve been in most of your homes, but I’d like to be in all of them at some point. It’s been a privilege to eat at your tables and have you at ours. To be present at births and be involved in weddings. To counsel you in hard times. I haven’t always loved you like I should. I have failed to love you in specific ways. I know that I’ve missed opportunities to actively love you, but I’m thankful for all of the ones that I’ve been able to take advantage of. One of the newest ways that I want to grow in my love for you is in trying my hand at firearms and hunting. Believe it or not, Heather and I both passed our Hunter’s Safety Course last weekend! We are now safe! We’ll have to see if we’re effective! I know a little bit of what he’s talking about. I care when you are hurting. And I care when you are sinning. One of the hardest things for me is to see some of you make foolish choices and walk away from God’s best for you. It makes me burn inside. Love can be a painful thing. I didn’t know how much a pastor can really love a church. And now I do. And I’m glad I do. I love you. That brings us to #5. Pastors can get the idea that it’s all about us, and it’s all about building our kingdom. Now, it is all about His kingdom! And we are supposed to be bear fruit. But that doesn’t always mean that churches grow and grow and grow numerically. In a demographic like ours, without that many jobs, just staying the same size church and growing a little bit each year is fruitfulness–especially if people are coming to Christ. Success in pastoring is being faithful to my calling. I define my role in pastoring as Preaching the Word, Equipping the Saints, and Shepherding the Flock. Some of you were in that first Sunday School Class that I taught back on April 18, 1998 when I taught about what a pastor does while I was candidating here. Preach the Word, Equip the Saints, Shepherd the Flock. I’ll be honest. Sometimes, I envy those who have large churches, large staffs, and other opportunities. That sometimes looks “successful.” But God has called me to be faithful. And leave the “success” up to Him. That’s success! Which goes along with #6. 6. HOW GOOD IT IS TO WORK AS A TEAM IN MINISTRY. We’ve been learning about how the church is a “Body.” And the body needs to work together as a team. My favorite story about this is Wild West Day–July 28, 2001. How many were here for Wild West Day? How many don’t know what it was? On July 28, 2001, our little church of about 120 people had a western fair for the community–a FREE western fair for the community and had 1200 people show up! 10 times the size of our church family! Over 1,000 guests, 1,200 hot-dogs consumed, 416 families contacted, 375 JESUS Videos given out, 156 Gospel-Bracelets, and who knows how many SNO-CONES? And I think the most awesome thing about it was that we all worked together for it. Nobody stayed at home. Nobody said, “I’ll let someone else do it.” Nobody kept their gifts to themselves. Everybody chipped in. And we did something BIG that touched our community for eternity. When it was all over, I preached from Psalm 133. Aaron’s Oil Beard. Who Good and Pleasant It is to Work as a Team In Ministry. I love the fact that this is not Matt Mitchell’s church and Matt Mitchell’s ministry. This is our church and our ministry together. I am thankful for all that all of you do–especially our board. I’m thankful for the team approach that our board takes in ministry. It is good and pleasant and holy like Aaron’s oily beard! I’ve learned #7. HOW HARD CONFLICT IS BETWEEN CHRISTIANS. It has not always been easy in these last 10 years. Don’t get me wrong. The boundary lines have fallen for me in pleasant places, but that doesn’t mean that every step has been easy. Before I came, I had 2 main worries about full time pastoral ministry. First, could I really get a sermon done in a week? I had always had more time to prepare sermons before I became a pastor. Could I do it week in and week out? I have learned that I can do it. I’ve now preached over 400 sermons here, and probably 500 when you add up guest preaching opportunities. But the other thing I was worried about was whether or not I could handle church conflicts or if it would be too much for me. I have handled them. We haven’t had very many because we are very focused on unity here. But we have had a number of them. There is nothing harder in ministry, than when folks leave the church because of a conflict between Christians. I’ve lost a lot of sleep over folks that have disagreed or gotten mad or gossiped or fought with me or other Christians. There was a patch of about a year and half when 19 adults left the church. Not together. In my time, we haven’t had a split, but 19 adults for various reasons had a problem with (primarily) me. And that was incredibly difficult. I’m so thankful for the training that we’ve received from Peacemaker Ministries about how to respond to conflict biblically. I don’t know where I’d be without it. I do know that I’ve been responsible for some of the conflicts. There was a patch of about 6 months when I had a list of people that I need to ask forgiveness from. You might have been on my list. It took me 6 months to reach all of them and ask for forgiveness. Thank you to those who gave it to me. I know that I have to keep on working at biblical peace-making and biblical unity so that our church family continues to experience the blessing of God. That leads me to #8. I’ve learned #8. HOW BIG A SINNER I REALLY AM. I think that I’m called to be a pastor because I need more time in the Bible weekly than some of you do. I need pastoring for my sanctification. I never knew that I could be an angry man until Heather came down with mononucleosis and baby Robin decided she didn’t need to sleep any more. I found out that I am an anxious man when things in the JESUS Video Project didn’t go the way I thought they should be. Or when there were disagreements with other leaders about the way we should go. I found out that I am tempted to laziness and to the fear of man so that I haven’t always led you bold and with vision–preferring a safer, more popular route some times. I’ve learned that I’m a big sinner. But thankfully, I have a BIG savior! I am so thankful for the teaching that came to us from a variety of sources, but most notably from CCEF and teachers like David Powlison and Paul Tripp. They’ve taught me truckloads more about my heart (the control center of my life) and how I need heart change through the gospel. God doesn’t just save me and then leave me the same. He wants to change me into the image of Christ. This August, I’m going to take 2 weeks to study on the doctoral level with the teachers at CCEF. I’m going to learn more about how to minister to people right where they are and right where they live with the truth of the gospel that changes us! I know that means that I’ll find out even more how big a sinner I am. And I’m sorry for you that you’ve had to live with the consequences of my failings these last 10 years. Thank you for bearing with me. Help me to grow! #9 was a real surprise. It shouldn’t have been, but it really was. I’ve learned #9. HOW EVERYONE EVENTUALLY DIES. I’m going to do. And so are you. I might be preaching at your funeral. And it may not be long. I’ve been at the hospital and seen suffering. And I’ve been at the graveside and seen and felt weeping. Which leads me to #10. I’ve learned #10. HOW BEAUTIFUL AND POWERFUL IS THE CROSS OF CHRIST. Again and again we come back to the Cross. The Lord Jesus Christ died to save sinners like you and me. He was sacrificed once to take away the sins of many people. I’ve said it hundreds of times from this pulpit, and Lord-willing, I’ll say it hundreds of times more. Turn from your sins and trust in the Savior. Believe the Gospel. Receive Jesus and be saved! The Cross, which was ugly and terrible is actually beautiful and powerful. I have learned so much by coming back again and again to Calvary. You and I can be ready for death by putting our faith in His death and His resurrection life. If you don’t remember anything else from the last 10 years, I pray that you will remember a focus on the Gospel, on the Cross, where the Prince of Glory Died. I invite you to believe in Christ and His Cross, and Christ alone. For 10 years that’s been the center of our partnership–the gospel. And because of it, I can say, as I have for the last 10 years. Yesterday, Jim Culbertson (photographer), Eric Tober (left and owner of cool car), and I (far squinty right) met with new church planting pastor, Mark Petras (center) at the meeting site of Crossroads Community Church in Duncansville near Altoona. The purpose of our meeting was to encourage Mark and be a resource to him as he helps Crossroads reach and disciple the people in the greater Altoona area. Pray for Mark and Crossroads! It's exciting to be a part of what God is doing through our family of churches in the awesome Allegheny District! I Am Found Out. I am the addict, the depressed one, the worrier, the self-injurer. In each of these books, to varying degrees, I see myself in the mirror (James 1:22-25). When each of these “counseling problems” is boiled down into their rightful biblical categories, I can recognize my experience of each and the seed of each besetting sin resident in my own heart. The least tempting for me is the cutting of self-injury. Perhaps I’m too narcissistic or too comfortable. Regardless, I’ve certainly been very angry with myself, as if my judgment should reign, and somebody should have to pay. I’m not constitutionally prone to depression, but I’m not immune either. I’ve tussled with the stubborn darkness and recognize my complicity with it. One long Autumn, my wife contracted mononucleosis and needed to sleep constantly at the same time as our little daughter decided to start sleeping as little as possible. I didn’t know I could be so angry or that I could be so depressed. Admission: I have an “extra plate addiction.” I’m not wallowing in alcoholism or binging and purging. And I’m not obese. But I love food too much and God too little. It comes out in my habits at the table and in my waistline. But even worse, perhaps, is my information addiction. This is a strength of mine–to know things. But, unchecked, it’s also my weakness. I’ve got over 50 blogs in my RSS Reader, and I can’t stand to not know what is going on with any of them. I’m an info-junkie. Above all, I am a “fear specialist” and am guilty of running scared. I’m a congenital worrier and struggle to rest. I can see more clearly now how I fill the role of false prophet–the visionary minus the optimism. I am found out. I Am Helped Out. Being “found out” is good because it’s honest and the first step towards growth. All of these problems have answers in the gospel of Jesus Christ. My gaze is not just directed at my sin, but more importantly, at my Savior. Jesus died for my injurious anger. He bore the punishment for my sinful judgments. I don’t have to make them any more. I can cry out for grace. Jesus walks with me through my depression. He understands the category of suffering and speaks to it. What depression is caused by the curse or Satan or the world finds its cure in His comfort and presence. What depression is caused by my fear, shame, anger, legalistic guilt, and unreasonable hopes is countered by the Cross, my new identity in Christ, my Christian family, and slowly putting one thankful foot in front of another in humble daily hope. Jesus challenges me to confront my addictions. He will help me to get violent and turn from the lies that motivate my gluttony and lust for information-mastery. He is the Holy One in the flesh who died for me. I am learning to fear Him in faith and grow accountable to others. Jesus speaks to my fears and to the roots of my fears. He will provide me with the future grace I need when I need it, like manna in the wilderness. I’m already dead in Christ, so what am I afraid of? Jesus is calling me to daily declare my allegiance to His Kingdom by promising, even swearing, to give His Kingdom to me! Why would I worry? I am learning to turn and cast my cares on Him because He cares for me. I Want to Help Out. This is “just” grace-based progressive sanctification overlaid on the messy problems of everyday life. As I’ve been helped, I want to share it with others. I want to become increasingly skillful at carefully listening and at lovingly speaking these gospel truths into the lives of others addicted, depressed, angry, and afraid.